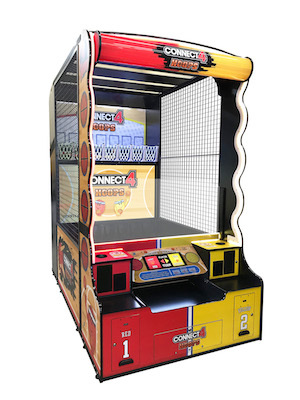 Bay Tek Entertainment is set to debut a compact version of is successful redemption game, Connect 4 Hoops at the 2019 Amusement Expo International in Las Vegas next week. Connect 4 Hoops HD sees one or two players shoot 7ins Bay Tek-branded basketballs and watch the 65ins high-definition screen to see who is first to align four balls horizontally, vertically, or diagonally on the augmented reality playfield. Smaller than the original, HD is designed to fit in most game rooms. Assembled, it is 9ft tall, 5’1” wide and 9’4” deep. “The most noticeable difference is this game is two and-a-half feet shorter than the original Connect 4 Hoops, and over three feet shallower. That’s really important for smaller game rooms with shorter ceilings. It also helps that it only ships on two pallets, versus four with the regular Hoops game,” said Rick Rochetti, director of sales and marketing at Bay Tek. “Connect 4 Hoops is such a success, so we wanted to keep the gameplay the same because we knew we had something special,” said Rochetti.